Enjoy local attractions & first class amenities; wi-fi, pool, jacuzzi, store, dog walk, propane, laundry, playground & more. Need something special, our staff will find a solution. Let us make your say a home away from home! Jammed in next to the next rigs which appear permanent with all kinds of stuff sitting next to them. Very junky! Strong smell of sewer so cant keep windows open and barking dog next door. I think I will stay in a truck stop next time. Not even going to go to the showrs. Not my type of park at all and I am shocked it got a Good Sam rating at all. Nice park but VERY NOISY. Do not plan to sleep later than 5 AM Harleys with loud pipes at 5 AM. Motorcycles, trucks, doors slamming. Many construction workers living here leaving for work. Not really a campground but more like an active mobile home park. Very disappointed when its called a quiet place, it is not.. WiFi does not work at all. I found staff friendly. Owners should be more truthful in advertising. When i asked manager about all the noise at 5 AM. She stated. Thats just the way it is.. The RV Park was clean. The staff were all friendly. There was a nice facility with mens and womens restrooms and showers, which were clean and nice. Also, there is a great laundry room with front loader washers and dryers that worked very well and reasonable cost. The dryers worked well. There was a little convenience store where you could buy food and treats as well as RV related stuff. They had DVDs for rent, a library, a game room. They have Wi-Fi, but in the evenings it apparently didn't have enough band width, so it was useless then. Got all checked after a 3 day trip from Texas, the weather up here was phenomenal not at all the cold temperatures everyone warned us about. My beast fit nicely in space 162 and the little ball of energy at the desk today was very helpful, thanks for all the ideas. Excited to see the temple and all the beautiful sites Salt Lake has to offer. Bathrooms and facilities are clean and my kids have been enjoying all the neighbors. Good people, Good Park! I have no idea how this place got a high rating. It was noisy with dog feces on our site. Spaces are close and difficult to get in or out. Barking dogs...rules are not enforced. We could not leave fast enough. We did not have reservations and the place was full. That did not stop the excellent office staff, specifically the young man who made several calls until he found a space available for the night. The spaces look crowded but clean & the staff excellent! This RV park did not live up to the ratings. It was so clost to the freeway you could smell vehicle exhaust. Also very noisy. We stayed there July 8 to 10th. We requested a space with grass, it was denied when there were at least 2 spaces with grass and were empty. I would not stay here again and do not recommend this park for any length of time. There seems to be quite a variance in ratings so it thought i'd add my opinion. We only stayed 2 nights so did not use the amenities. Best part is plentiful shade, clean, orderly and quiet. In my slot I couldn'T get a satellite signal, the price of the shade. The spaces are narrow but allowed for 3 slides and an awning. Space was paved and level, a pull through with room for tow vehicle behind. For my purposes the property was pricey but i've paid more and gotten less. We would stay here again. We have been staying at Mountain Shadows since 2006. 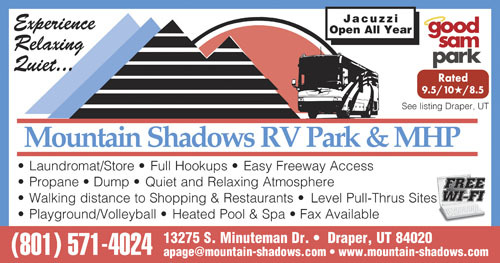 There is no RV park that compares to Mountain Shadows including location to many different venues. The facility is very clean, and the employees are friendly, professional, and always willing to help. And there are NO TRAIN WHISTLES at all hours of the night! We always choose to stay at Mountain Shadows whenever we pass through the Salt Lake City area. Park is a Dump! Sites are way to small! Management is a joke! Reservations: " DO NOT MAKE THEM" The staff will mess them up! And god for bid you let them put a credit card on file, THEY'LL RUN IT WITHOUT EVEN TELLING YOU!!!!!!!!! This will be the last time we stay here and will never tell others to stay here!!!!!!!!! Perfect location. Will stay at again. 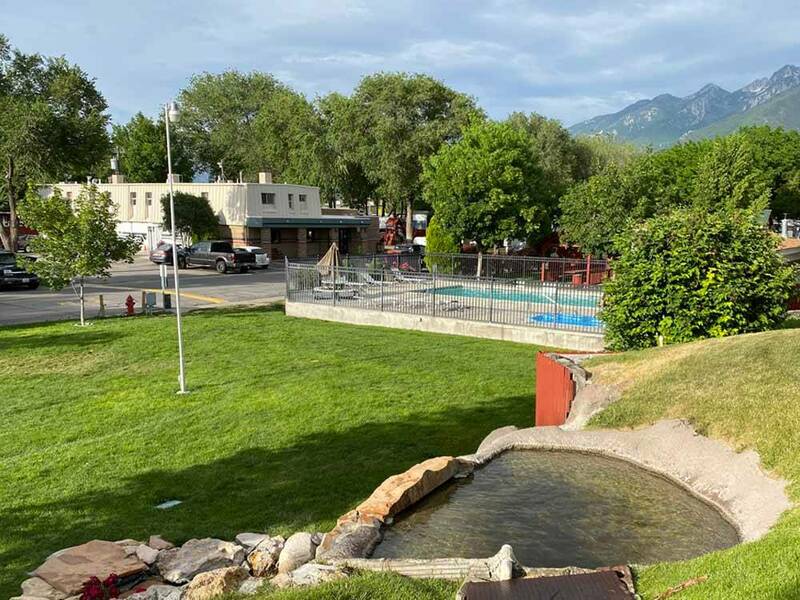 Good location for all the attractions in and around Salt Lake City. Facilities were well maintained. Only one negative; the youth tend to gather around the bathrooms and showers in the evenings. After Review some of the reviews I was hesitant to stay here, however I decided to trust the Good Sam Club Rating and Stay. And wow I must say the customer service is amazing. The internet speed was awesome and I was very happy with my site. This park is like a little hidden oasis in the middle of all the hustle and bustle of city life. My first visit was over the Easter Holiday, my daughter enjoyed a fantastic Easter Egg Hunt that all the employees put of for their guests and city locals. I recently stayed her for about 2 weeks on this last visit and I will definitely be back. When in the Salt Lake City, Ut area, this is our park of choice. Yes there are permanent residents, but they are completely separate from the daily, weekly, and monthly campers. Even though it is close to the highway, it is a quiet park. Plenty of room to get into and out of sites and sites are shaded. We have recommended this facility to several friends and it is now their campground of choice. Staff is very friendly and go out of their way to accommodate your every need. We do not use the restroom as our motorhome provides what we need so we didn't rate the restrooms. I have no idea how this has such high ratings! Park is a dump, looks more like a homeless shelter. Very hard to maneuver around with truck and trailer. Spots are very close together. Random homeless people walking around at all hours of the night. Did not feel safe here and left. There is a beautiful mountain located behind the park. Other than that, there isn't much appeal there. The access road separates you from the freeway so lots of noise. There is an apartment complex and a mobile home part that is all part of this RV park. There are Block Watch signs up through the park. The spaces are so close together that it was difficult pulling the rig out the next morning. There were all ages of RVs at this park in all levels of condition. We just didn't feel safe at this park and it was noisy. We are not sure how this park had such high ratings.